Looking for a fun and exciting activity for your entire family? 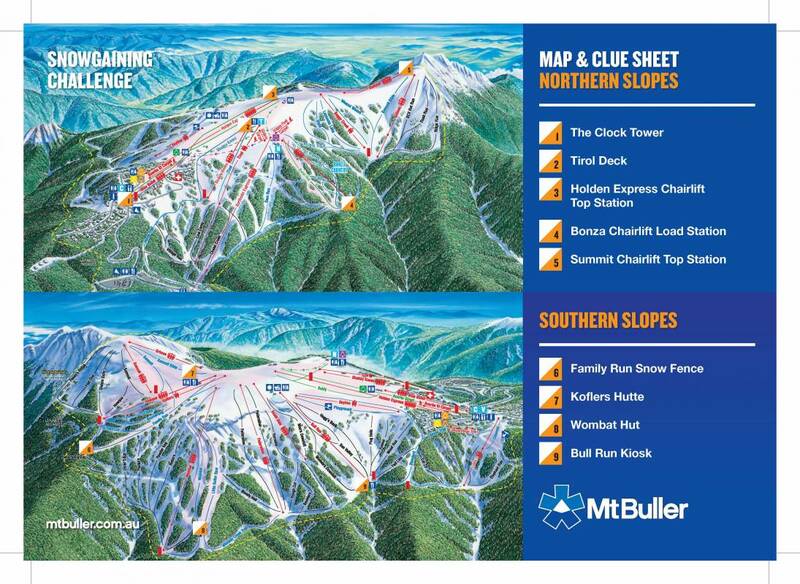 Want to explore the snowfields of Mt Buller from corner to corner? 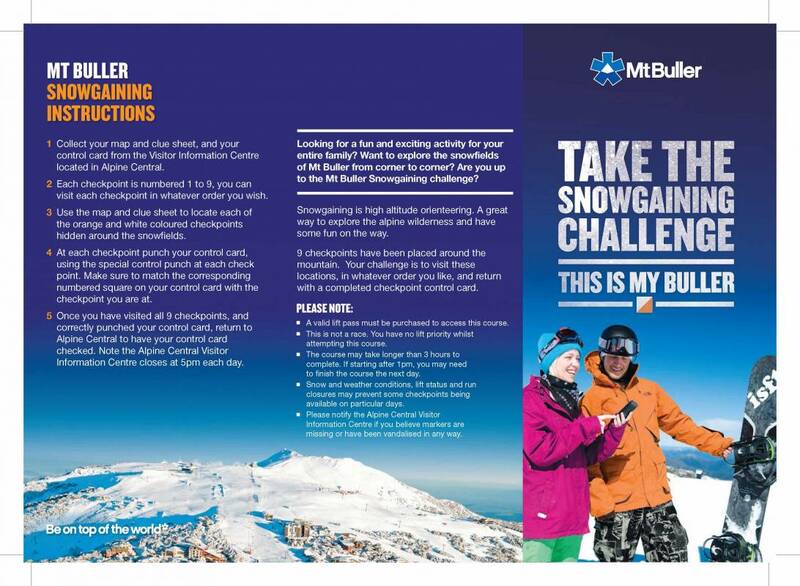 Are you up to the Mt Buller Snowgaining challenge? Snowgaining is high altitude orienteering. A great way to explore the alpine area and have some fun on the way. Nine checkpoints have been placed around the mountain.Your challenge is to visit these locations, in whatever order you like, and return with a completed checkpoint control card. 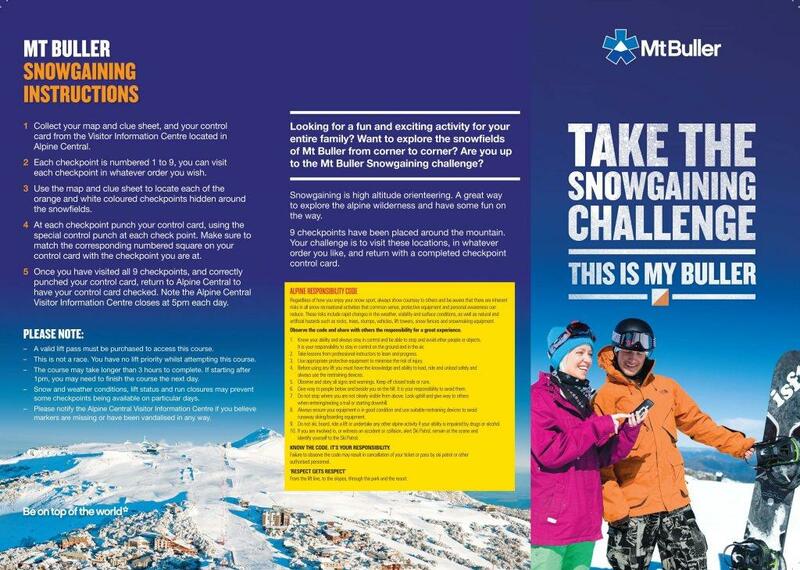 Everyone who completes a full card receives a Mt Buller branded multi tool! Collect your map and clue sheet from Alpine Central, or download the map HERE and clue cards HERE before you arrive.. Collect your control card from the Visitor Information Centre located in Alpine Central. Each checkpoint is numbered 1 to 9, you can visit each checkpoint in whatever order you wish. Use the map and clue sheet to locate each of the orange and white coloured checkpoints hidden around the snowfields. At each checkpoint punch your control card, using the special control punch at each check point. Make sure to match the corresponding numbered square on your control card with the checkpoint you are at. Once you have visited all 9 checkpoints, and correctly punched your control card, return to Alpine Central to have your control card checked. Note the Alpine Central Visitor Information Centre closes at 5pm each day. Everyone with a completed control card receives a branded Mt Buller multi tool. A valid lift pass must be purchased to access this course. This is not a race. You have no lift priority whilst attempting this course. The course may take longer than 3 hours to complete. If starting after1pm, you may need to finish the course the next day. Snow and weather conditions, lift status and run closures may prevent some checkpoints being available on particular days. Please notify the Alpine Central Visitor Information Centre if you believe markers are missing or have been vandalised in any way.